Apistogramma cacatuoides is a stunning dwarf cichlid common in the aquarium trade. Large, colorful, and easy to find, it quickly became a popular fish amongst hobbyists and scientists alike. It is often labeled as “cockatoo dwarf cichlid” or “crested cichlid” due to the large rays found on the dorsal fin of male specimens. Easy to care for, A. cacatuoides is one of the best beginner Apistos given that the tank has plenty of hiding areas and that the basic “tropical” water parameters are maintained. They are commonly available in most pet stores, but care should be taken in order to get healthy fish. Commercial inbreeding has weakened the lines and has caused many deformities in this species, so if possible, purchase them from a reputable local breeder. Given the right conditions, breeding can be witnessed. The female will turn bright yellow with black markings and will start guarding a territory. Eggs will be deposited on the roofs of caves and the female provides maternal care during the entire process. The eggs hatch after 3-5 days and enter a larval (wiggler) stage, later going free swimming. It is one of the most rewarding experiences in keeping these beautiful dwarf cichlids. All in all, Apistogramma cacatuoides are easy to keep and very rewarding. Given a little a bit of care, this fish will provide a multitude of interesting behaviors to keep you entertained. Apistogramma cacatuoides (A200-203) is a popular dwarf cichlid found in Peru, Brazil, and Colombia. Males have large spines and fin extensions on the dorsal and caudal fins. They also have relatively large lips in comparison to other Apistogramma. Since they have been kept for many years by aquarists, various vibrant color strains have emerged including double red, triple red, and orange flash. Most of these strains are available at local pet stores. Seldom seen are wild caught or wild strains of cacatuoides, but in my personal opinion they are the prettiest. Depending on the location of collection, WC Apistogramma cacatuoides males can have various shades of blue, red, yellow, copper, and more. Move your mouse over the map for more info. 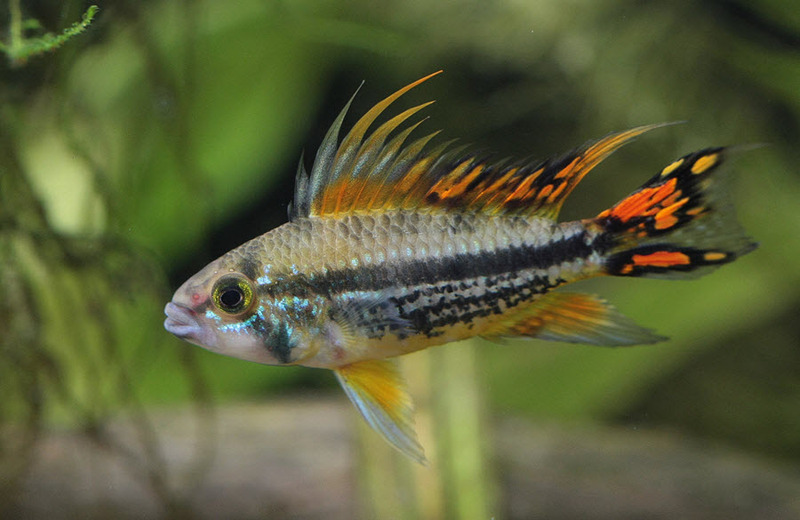 Apistogramma cacatuoides is found in the Amazon River Basin, in Brazil, Colombia, and Peru. They are found as far south as the West Solimoes of Brazil, as well as tributaries of the Amazon River throughout Peru and Colombia. In this huge range, distinct populations tend to show specific traits in terms of patterning and coloration, as described earlier. Since they are not the largest fish in the river (pirahna, peacock bass, etc. ), Apistogramma cacatuoides tend to stay within small forest creeks, small streams, or tributaries off of the main waterway. Generally, they congregate where lots of leaf litter banks against the edge of a stream or pool. In all of these sections of the river, the water is generally still or very slow moving, and is extremely acidic from the presence of all the tannic acid emitted from the leaf litter. In the case of Apistogramma cacatuoides, they are most often found in clear or white water rivers. They are rarely found in black water… but occasionally, due to season or shifts in climate, specimens have been documented to be found in those systems. In my experience, setting up an adequate tank to house Apistogramma cacatuoides is relatively simple and inexpensive, the materials being common amongst most Apistogramma. Since this species is very boisterous and larger than most, I suggest using a 20 long or larger tank to properly house a pair or trio. Setup is easy. I generally take a generous portion of leaf litter and a few cups of soft, fine sand and place them into a small bucket. I then mixed both components thoroughly, adding my desired ratio of sand to leaf litter. Generally, I also mix in small bits of ground leaves to add a more textured look to the substrate. After placing a layer of the mixture into the tank, I add driftwood and various caves to create distinct territories for the fish. Something that is unconventional that I personally use in my tanks a thick nylon spawning mop. I place it in one corner of the tank to act as a hiding place for frequently chased fish or stressed fish. Often times, it collects lots of bacteria and microcrustaceans that newly hatched fry can use as a source of food. I also place a sponge filter directly next to the mop in order to provide adequate circulation (and increase surface area for bacteria to grow) in that particular region of the tank. Since Apistogramma tend to inhabit regions where flow is minimal, I run the sponge filters in a manner that produces very little current, but is still properly able to filter the tank. After filling the tank with water, I add a handful of Amazonian frogbit to the water’s surface. It is a fast growing, long rooted floating plant that provides shaded regions in the tank and is a valuable source of nutrient export. In the long roots of the plant, detritus collects and acts as a feeding place for fry. In order to maintain the tank, I perform small, weekly 30-50% percent water changes with water at the same temperature as the tank, and with similar chemical parameters. When refilling the tank, I go extremely slowly in order to keep the chemical parameters from swinging unexpectedly and shocking the fish. Apistogramma cacatuoides is a cave or crevice spawner. It lays its eggs amongst leaf litter or wood along the banks of the rivers. Once the dry season reaches is end and the rains of the wet season begin, the female will put on a yellow breeding dress and draw the male into a spawning site, where she lays eggs and the male fertilizes them. Generally, the female will guard and manage the site closest to the eggs while the male will protect a boundary around the female. They both will work together to raise the fry until they are able to fend for themselves. On occasion, the male will be driven out by the female at a certain stage in fry development. 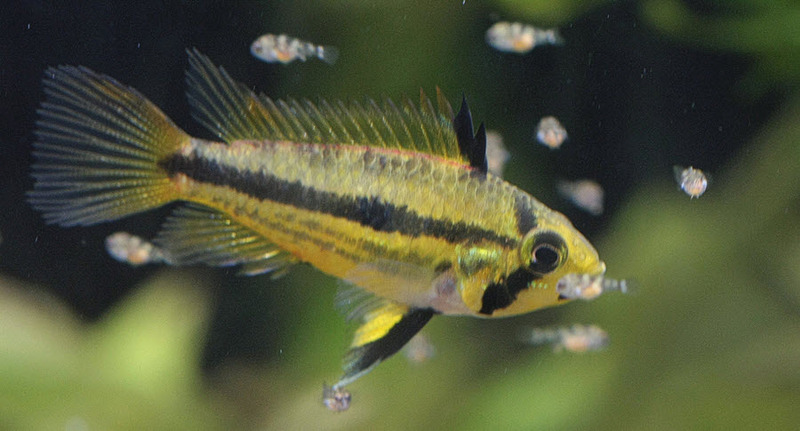 Breeding Apistogramma cacatuoides is very simple. Since they breed during the transition from dry season to wet season, I mimic the conditions of dry season for a few weeks by skipping my weekly water change. Over time, the water hardness and chemical parameters will alter. After around 3 weeks of no water changes, I will feed heavily for around 1 week. After the period of 4 weeks, I will perform a 80% water change using water is that is approximately 6-8℉ lower in temperature than the tank water. Using a airline, I will steadily drip the water into the tank until it is filled to the brim. Generally, within 24 hours of the water change, I will have a large spawn of 150-250 eggs and a thin female guarding them. If there is more than 1 female in the tank, I may expect more than 1 spawn. The fry will generally take 3-5 days to hatch and enter the larval stage, before going free swimming at day 10-12. Once free swimming, I feed freshly hatched baby brine shrimp and start the grow out process.